How Email To Case Automation Works? 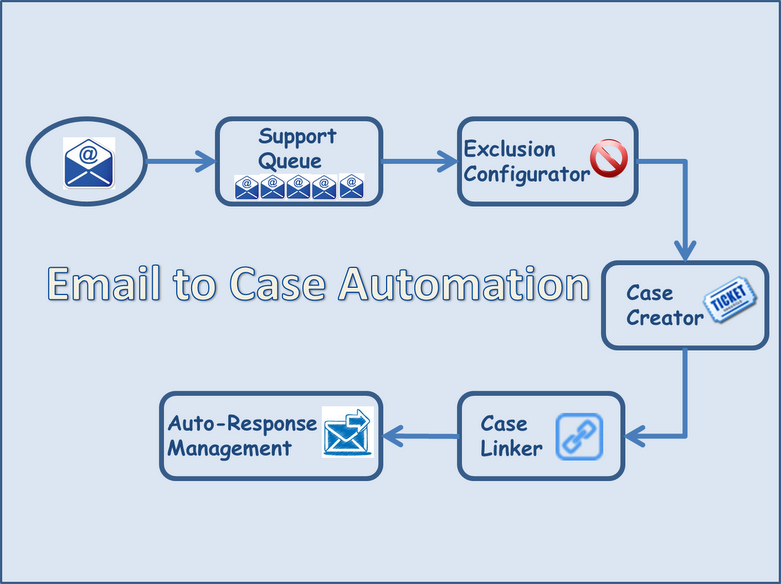 Email to Case Automation takes the case creation automation to the next level. Unwanted domains can be excluded specific domains or email addresses. Email loop protection settings will also prevent auto-responder emails from creating emails. Exclusion criteria for certain user-scenario can be used to override behavior. Case record is created with case-fields populated from emails as well as fields that have been configured with default values automatically. Case record is linked with either contacts or accounts based on the settings. If no match is found then the case could also be linked to a Dummy account or Dummy contact. Default User / Default Team: can select a default user or team that would be the owner of the new case. Round Robin Case Assignment: Case would be assigned to the members of the team (sequence: alphabetically sorted by First Name). Please note that because of technical limitations, this algorithm will not work in CRM Online. User – Account / Contact Custom: The CRM user selected (in the field (eg. Preferred User) of Contact or Account will become the owner of the new case. User – Account / Contact Owner: The owner of the Contact or Account that was linked to this case will become the owner of the new Case. Automatic email notifications (both internal and external) could be sent on case creation based on the email template selected. Further, there is an additional functionality to add direct URL for case record in CRM (this would allow CRM users to directly browse to the case record in CRM).